There have been a number of questions about high-speed flash sync (HSS), and how it affects the output from your flash. There were also some questions asked about high-speed flash sync with this recent post where we tried to reverse-engineer a photo. The large (60″) umbrella to my left, and a small reflector to the right to add a little bit of fill. Ideally the reflector should be larger and closer – but this isn’t so much a portrait session as it is about photographing sequences of images at various shutter speeds. I stayed close to the umbrella – keeping it as close to the lens’ axis as possible – so that the light is as even as we could manage with a single speedlight setup. Of course, the reason for it only being one speedlight is that we can now observe its behavior. 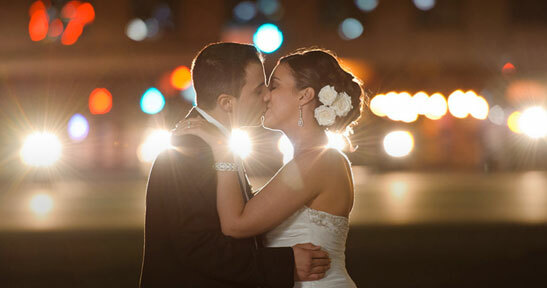 For all the images in this article, the speedlight was set to give full output in manual mode. This way we aren’t bringing in the uncertainties of TTL flash. 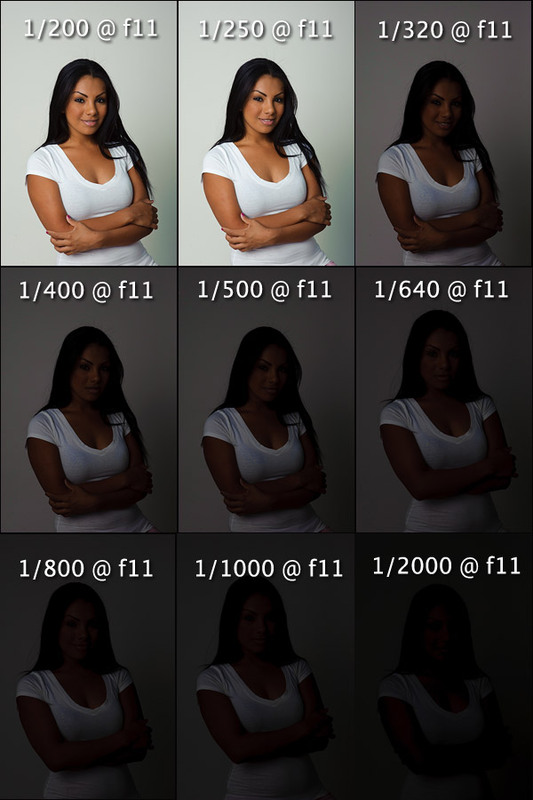 TTL flash is an automatic metering mode, and there will be variations in output if we change our composition. Manual flash is consistent and predictable. I worked at full output so that we can more clearly see some of the effect of going to high-speed flash sync. Initially, I triggered the flashgun / speedlight with radio transmitters. PocketWizard Plus II units, to be exact. They don’t allow high-speed flash sync. So we can now see what will happen then. For the final sequences where we go to high-speed sync (HSS), I used an on-camera speedlight as a Master, to fire the Slaved speedlight mounted with the umbrella. The Master’s output was disabled, so we’re just dealing with one speedlight’s effect. In the spirit of keeping much of the info on this site system-agnostic, we’ll look at how the Nikon D3 and the Canon 5D works. How does the camera’s shutter work? Before we get deeper into this, we need to cover some basics first – how the camera’s shutter works. The focal plane shutter found in D-SLRs, consist of two curtains that open and close. They open and close with a certain timing, to open the sensor / frame to light. 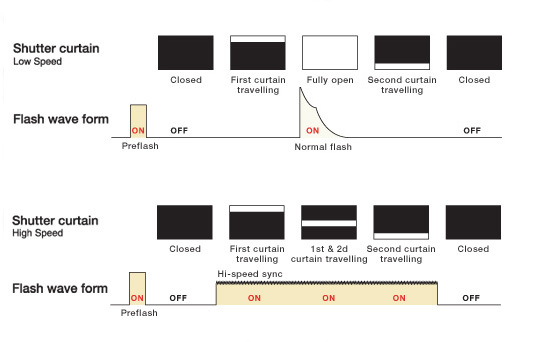 When the shutter is tripped, the first curtain opens, revealing the sensor (or frame) to the light, and then the second curtain closes. The time interval between the first curtain opening, and the second curtain closing, is the shutter speed. It can be 1 second, or it can be 1/60 of a second, or as short as 1/4000 of a second. With high-speed flash sync – a truly amazing bit of engineering – the flash’s output is released as a rapid series of light pulses. The flash is now effectively continuous light over a very short duration. Now, when we go over maximum flash sync speed, the flash is released as that short period of continuous light, and we can take our shutter speed much higher than maximum flash sync speed. This change from a high-energy near-instantaneous burst of light (normal flash), to the short period of continuous light (high-speed flash sync), does imply a loss of effective power. It makes sense in that a lot of the light from our flash will just hit the shutter curtains, and won’t hit the actual sensor. In other words, much of the output from the flash in high-speed flash sync mode will be lost. So let’s look at how the flash output appear using old school radio slaves which don’t allow us to go to high-speed flash sync. This is how studio-type shoots are usually set up .. various flashes and light modifiers set up, and balanced .. and then tripped by radio slaves. Normal flash sync. In other words, no high-speed flash sync. Here is the first sequence, using the Nikon D3. The next sequence is with the Canon 5D. I wanted to show that the behavior of normal flash sync and maximum flash sync speed is universal for all focal plane shutters found on D-SLRs. The Nikon D3 (like most of the bigger Nikon D-SLRs) have a maximum flash sync speed of 1/250th. Below that, and if there is not much ambient light, the choice of shutter speed has NO effect on the flash. We just need the entire sensor / frame to be open to the blitz of flash. This can be at 1/8 or 1/60 or 1/125 … as long as it is at, or slower than maximum flash sync speed. Here is the same sequence for the Canon 5D. The 5D has a maximum flash sync speed of 1/200 and we see the same effect with the higher shutter speeds obscuring the flash exposure. btw, if for some reason you want to see slightly larger versions of those, click on the two sets of images for the larger side-by-side version. 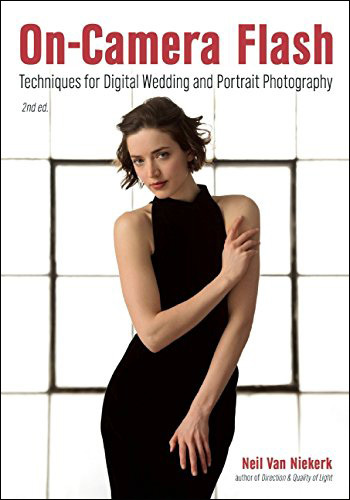 As you could see there with the sequence of images for the Nikon D3 and the Canon 5D – even though you might be working at maximum flash sync speed – you might still get the edge of a shutter curtain. This is due to something called ‘propagation delay’. For these images we were using radio transceivers to trip the flash. (Pocket Wizard Plus II units.) As mentioned earlier, they are simple devices that just trigger the speedlights. There is no intelligence there between the camera and speedlights. So this is where slight synchronization errors can creep in. Where we are working right now at maximum flash sync speed, we’re on the very edge of any specific camera’s capabilities. So when we trip the shutter, the camera has to fire the transmitter mounted on it; which then trips the receiver connected to the speedlights / flashes; which in turn fires those speedlights / flashes. There is a whole chain of events that take place within finite time. And that is where any slight synchronization error will show up … just like it does here with the edge of the shutter curtain showing. This is a common-place occurrence, and not just inherent to the two cameras I used here. Any studio shooter will have experienced this problem and will know to use a shutter speed lower than maximum flash sync speed when shooting in the studio. A shutter speed like 1/125 or 1/100 or 1/60 is fine when working in the studio where ambient light levels are low. The shutter speed has no effect then on the flash output, so any shutter speed lower than maximum flash sync speed is fine in the studio. On-location though, I do use maximum flash sync speed, even if there is the chance of propagation delay. The reality of on-location photography is that we are much much less likely to see the effect of flash exposure at the edge of the frame. For example, I mainly do portrait photography on location. My subjects are usually more centrally placed. Hence, propagation delay doesn’t affect me. I shoot at maximum flash sync speed to get the most efficiency from my flash. Okay, finally we get here. Let’s see what happens when we go past maximum flash sync speed, with HSS enabled. Here is what the Canon 5D does. Very similar to the Nikon D3, with a slight quirk around the point we get to maximum flash sync speed. The Canon 5D, and the Canon 5D mark II, both have the same quirk at maximum flash sync speed. If you are at max flash sync (1/200), with or without HSS, the output is affected differently. This is something I mentioned in an earlier post on maximum flash sync speed. It is just something to be aware of with the 5D bodies. So let’s look at the implication of those two sequences of images. If we are in normal flash mode, then the flash is an instantaneous burst of light. We just need our entire frame / sensor to be open, for flash exposure to be consistent from edge to edge. The moment we go into HSS mode, then the flash output is essentially continuous light. And … continuous light is affected by shutter speed choice. Think of ambient light. If we change our shutter speed, we change our exposure. This is exactly what happens with flash in HSS mode. As mentioned, since HSS flash acts like continuous light, it should have a similar linear response So let’s see what happens when we change the aperture in relation to the change in shutter speed. And there is the linear response, clearly to be seen. 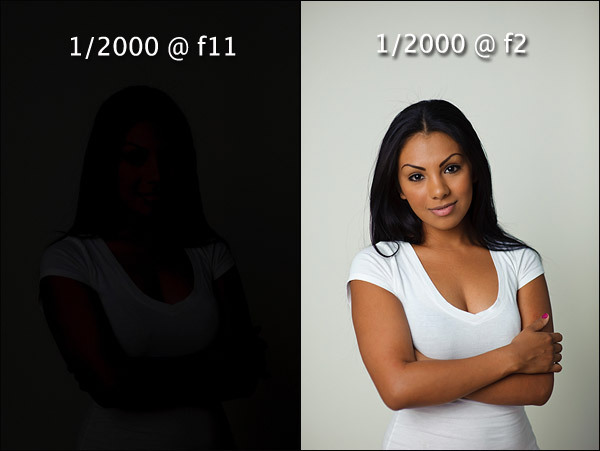 For these examples, we had 1/250 @ f11 … which would, for ambient light only, translate to 1/2000 @ f4 as an example. Yet, here we have an equivalent of 1/2000 @ f2 when going to HSS. Now, when we go even higher, the linearity starts to flatten out. Instead of 1/4000 @ f1.4 it would appear that we lose about 1 third of a stop of light, and have to open up by dropping the shutter speed slightly to 1/3200 to get the same brightness. But this could also be partly due to working at wide open aperture on this lens. 1. When we work in bright ambient light, then we have a sweet spot at (or just below) maximum flash sync speed, if we want the most efficiency from our flash. This is because the higher shutter speed implies a wider aperture .. and this wider aperture allows our flash to reach further, or work less hard for the same exposure. 2. If we want correct flash exposure with HSS flash, then we need to move our flash much closer to our subject if we are using flash as the dominant source of light. Or we need to be aware that our flash will be merely fill light, since the output is affected dramatically. 3. If we want to control our depth-of-field, we are much better off using neutral density filters, than going to HSS mode. 4. You can’t “overpower the sun” by going to HSS. If anything, you should not be in HSS when you are dealing with bright light. You need to do something entirely different to overpower the sun with flash. This idea that you go to a much higher shutter speed to control the available light when you use flash, is one of the biggest fallacies I’ve come across on the various photography forums. It simply does NOT work that way. The next section will show exactly why. 5. 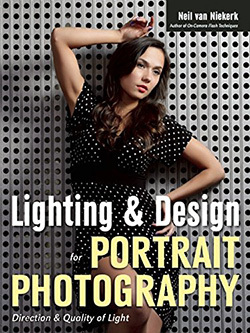 Because of the loss of effective power with HSS, you need to double up, or quadruple up on speedlights to compensate if you are shooting in bright light. Alternately, you can move the flashgun much closer, and use direct off-camera flash, as with this photograph. This is Aleona, one of our models at the flash photography workshops, leaping into the air. I wanted to completely freeze any movement, and went to a high shutter speed. controlled wirelessly with the on-camera flash set to Master. Hopefully this article will help illustrate what happens with high-speed flash sync. What I wanted to show here is that there is something very specific happening, and that it is predictable. When we are aware of what is happening, we can work with it, or around it, with a clearer understanding. Once we understand what is happening with our equipment and the technology we are using, then it becomes much easier to do what we really want to do … create inspiring photographs! Thanks for putting this together Neil. A lot of effort went into this and I think it’s worth reading more than once to get the full benefit of it. You mentioned that “Initially, I triggered the speedlight mounted with the umbrella, with radio transmitters. PocketWizard Plus II units, to be exact. They don’t allow high-speed flash sync.” I’ve always thought this way too about the high-speed flash sync ability of the PW Plus II units but then I came across an blog article by Damien Lovegrove https://www.prophotonut.com/2010/05/23/18000th-flash-sync-with-broncolor-mobil-and-canon-5d-mk2/ and since then I’ve been trying to get my head around what exactly is going on here. I’m still no wiser, but still keen to understand more about what can and can’t be done with current technology, so I’m always interested in reading posts like this. Thorsten, it is similar to what I explained here in using the Quantums at higher than maximum sync speed, and using the slower decay of the signal when shooting at full power. so, Neil, let me ask.. even if I use the cheapest wireless triggers like “made in china” with no-ttl, only manual, BUT i have got dedicated flash with HSS.. so then.. am I able to reach highest shutter speeds for example 1/500 ? I mean: it depens only of flash? or it depends of triggers too? 2. you use the camera and flash’s wireless system. 3. you use appropriate wireless triggers such as the Radio Poppers that utilize the wireless system of your camera. So in your case, you’re out of luck with the made-in-China triggers. @Thornsten, I’ve seen similar things done by using a connected flash to obtain high speed strobes from a monolight but not a pocket wizard. Interesting stuff! So, from f/11 to f/4 is a drop of 3 full stops. This is the only way for me to keep track of full stops. hi, have u given Alpha system flash a try? I wouldn’t mind having a top-end Sony D-SLR though. That said, I would be hugely surprised if the Sony cameras … and Pentax and Olympus … didn’t follow the same observations here. There is a definite physical and mechanical mechanism at work here. It is predictable. A very good, clear and good understandable explanation. I like to use large apertures for portraits thus HSS is an interesting option in some cases but it is clear that it can be tricky too. I’m a fan of your website and from some of the tutorials I make a PDF file directly from your website. 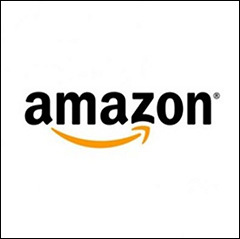 I don’t know if you will place tutorials in your new book otherwise it is maybe an idea to place Tutorials as a PDF directly as a download on your website. You rock! This analysis is dead-on exactly what I needed to read as I tinker on the edge of HSS to attempt to over power the sun with less flash while using a wider aperture. I’ll stick to my higher powered flashes and ND filters for now. Thanks again Neil! I had read somewhere that regular flash can sync at much higher speeds if you have an electronic shutter. I tried this with my old point & shoot and a slaved flash and seemed to do fine until about 1/800 of a sec shutter speed. This was a cheap camera, but maybe you could go higher with something more recent, or on camera, and more sophisticated. I guess what I am trying to say is keep HSS for fill flash at higher shutter speeds but if you really want to use max sync for the power, why not buy a good camera with an electronic shutter? Can you shed light on the 1/320 non-HSS mode of the Nikon D300? How does it work without HSS? Also, I tried some experiments on sync speed with a YongNuo YN-560 flash and found the results hard to explain. Here’s the baseline shot at the sync speed, with the flash on-camera (sorry, my flash is stuck at zoomed mode). Michael … here is what happens at 1/250 and 1/320 flash sync on the D700 and D300. Just found your website by accident and your explanation of how HSS works and why you need to use the max sync speed for best effects is just SO clear. Much of this stuff I kind of figured out myself, but this provides me the knowledge to know what I’m doing and not relying on trusting things will work out well. Thanks for that! Please keep us posted via the monthly newsletter when you’re planning to come over to Europe (Netherlands) for a workshop. Excellent post once again. 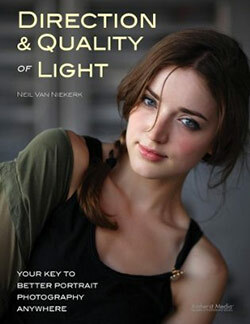 I’m eagerly awaiting your your posts on balancing flash with florescent lighting as well as post processing! I think where HSS really excels is when using something like a 70-200 or even an 85mm. Its very easy to get the flash close by your subject and have more than enough power to even use a shoot through umbrella at 1/2000 or higher. I have been experimenting alot with this lately and have been pleasantly surprised with the results. I would definitely recommend using a supplemental battery pack attached to your flashgun of choice. It really speeds up the recycling time. I have a canon T1i and a 580 ex ii that I use in ettl mode. The other day I was on a shaded L platform, and the day was very bright. I exposed properly for the sunlit background maybe around 1/200 for the max sync speed and f16. When I shot the picture, the background was exposed correctly, but even with direct flash (after bounce failed) my subject is severly underexposed. When I opened my aperature, my subject was properly exposed, but the background was obviously blown out. Can you take a moment to explain this phenomenon? Is this an application for a neutral density filter? Regardless, thanks for taking the time to answer our questions. Everything on the site is great. Loved your book, can’t wait for the second. Bryan … f/16 is a pretty small aperture. – you had your flash set to HSS mode. 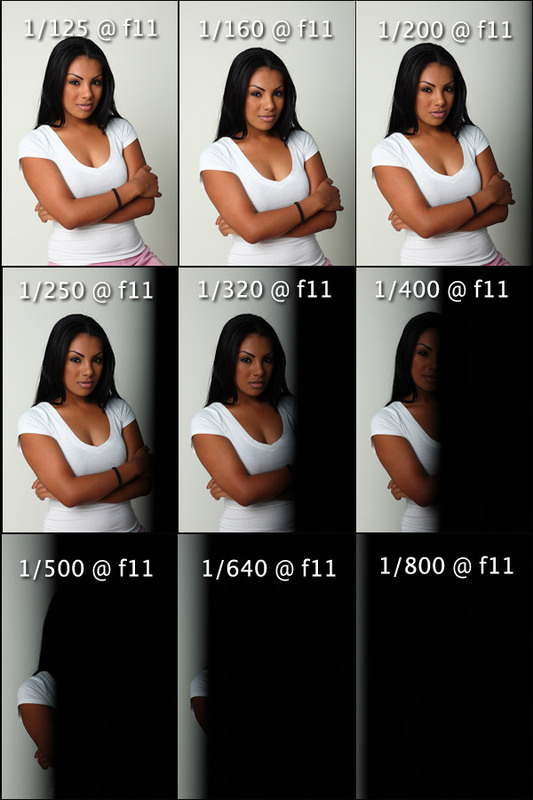 Using a ND filter wouldn’t have helped you here, since it affects both the flash and the ambient exposure. Thanks yet again for a wonderful tutorial. I have been meaning to raise this issue before, and the issue is one of flash duration. I have never seen you mention it in any of the articles of yours that I have read. And I would be grateful for your view on the subject. Based on my readings and the specific advise I have received, one ought not to set one’s shutter speed to a duration faster than the flash duration. My Metz speelights have a flash duration of 1/200s at Full Power, so even if my camera can sync at 1/250, 1/320 or 1/500 I would never set the camera to a shutter speed faster than 1/200s for if I did I would in effect be cutting off some of the flash exposure as my shutter would close before the flash had time to discharge all of its light. As far as flash duration goes, most companies, Nikon being a notable culprit, quotte flash duration figures according to the t5 standard. This is a very generous standard that gives figures for flash duation that are faster than a photographer would find applicable in real world use. The t1 standard preferred by Metz provides data that is more useful (realistic) to a photographer. I had a Sony flashgun, for which there was no flash duration, and by doing a series of test shots at Full Power flash and a variety of shutter speeds I found that the flash duration was around 1/320s. I came to this conclusion by reference to the histogram for each shot; there was a clear difference at very fast shutter speeds (the test camera used can sync at any shutter speed up to one two-thousanth of a second). Your views on this topic would interest me very much. Very helpful article as I experiment with HSS myself. Thank you for putting the time into doing this for everyone. Neil, I’ve heard that the old Nikons with hybrid shutters (the D70, D40, and I think the D100) can sync at any speed if the flash is non-TTL. On these, would it be fair to treat flash exposure above sync speed (1/500 on those bodies) like a video light? As in, can you control flash exposure with shutter-speed, similar to HSS? Ifty .. there are several older D-SLRs with electronic shutters where you can go higher than the stated max flash sync speed. I tried to distinguish that here with this article by referring to cameras with a focal plane shutter. The D70 has an electronic shutter, as well as the D2x (afaik), but not the D100. The original Canon 1D also had an electronic shutter, afaik. As mentioned in this article, you do have to think of HSS flash as continuous light when you go over max sync speed. Great article Neil. Question though. At the max sync speed, 1/200 for the D90 I use, if I close the aperture so I don’t blow out the background, will I need more power from my flash to make up for the smaller aperture? I’m trying to shoot indoors, with my subject against a wall of windows. I want what’s outside to be the background, without being blown out, and my flash to light the subject. Rich .. if you’re bouncing your flash for that scenario, you will most likely not have enough juice in your flashgun. You will have to do something else to get an f11 range exposure for your indoors subject, to retain detail for the outside areas. For this, bounce flash wastes too much power to be a workable idea here. Cannot thank you enough. You helped me understand HSS, which for the longest time had confused me. Your illustrations are (as usual) very informative and very usable. What I appreciate the most is your willingness to share and taking time off to pen your thoughts. … I just shoot at maximum flash sync speed then to give me the most efficiency from my flash…. it could come across that the most efficient flash output you will get from your flash is at the max snyc speed. But if I am shooting slower than that my flash efficiency should be the same, it would only decrease it if going above into HSS, right? Just want you to say yes, yes to that statement to reinforce what I am thinking. If you don’t go over max sync speed, then your flash’s output is exactly the same for the same aperture .. regardless of your shutter speed. However .. and this is a big however … when you are shooting in bright light, then you have to juggle your shutter speed / aperture / ISO settings. And then to help balance the flash against the available light, you’re usually better off shooting at max sync speed … since this will give you the widest possible aperture while remaining at max sync speed. That wider aperture will mean your flash has more reach. Or another way to view it, your flash will have more effect at the wider aperture. Follow the tutorial again about max sync speed’s value. It all comes together between that article, and this article on high speed flash sync. 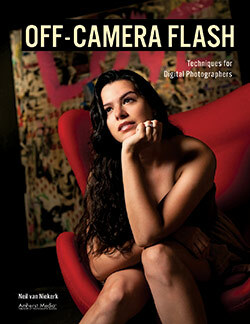 2. using flash in bright ambient light. … and then you’ll see the thought process makes sense. Hi Neil, i need some input from you. I want buy some seamless paper (white, black, and gray) for portrait. What type of white and gray color (so many white and gray type) good for portrait from your experience? I use the Savage seamless paper backdrops, which come in a variety of colors. They do need some type of support system of stands and a cross bar. First, I absolutely adore your blog. Beeing new to flash photography I have learned a ton of info over 2 days of reading. Thank you SO MUCH for such clear explanation!!! Now. I would like to try HSS in my little studio. My set-up 5D markII, 800 alien bees light with the soft box, reflector, sybersynk trigger and reciever. I would like to explore a possibility of shooting at the wide aperture with a studio lighting. Sorry for a stupid question (I am just learning studio set-up) how do I put my alien bees in a HSS mode? Is it something in a camera I have to set? Irina … afaik, you can’t take the Alien Bees into HSS mode. You need a dedicated speedlight for that. If you want a wide aperture in the studio, just dial down the power on your flash units, or use more diffusing. Or alternately, use a neutral density filter on your lens to get that wide aperture. Thank you a lot. I got your book and will read it front to back. Keep on doing such wonderful job for all of us!!! My 2 cents: yes, this is a Catch 22 — if you use HSS mode, the flash power drops approx 2..3 EV, also if you use ND filters (there’s more flash power needed). The only way out seems to be to use those powerful portable flash units (>= 400 Ws). Or is there another way? *BUT* … the more powerful (=the slower), the better!! Trick is, that the main speelight is now burning throughout the exposure process, just like a constant light source. On full power these small flashguns should have flash durations of approx 1/1000 … 1/400 second. thanks for this very interesting and eye-opening post! Something I do not really get: You point out, HSS would be not a good idea when fighting direct sunlight, regarding the power-loss of approx 2..3 f-stops. If my calculation is right, then this should give the same exposure, but with a really nice shallow depth-of-field. … sums up to 0 EV => same exposure as in (A), without the need for ND filters. Vicco .. check your math again. Changing from 1/250 to 1/1000 is a 2-stop difference. Changing from f16 to f2.8 gives you a 5 stop difference. 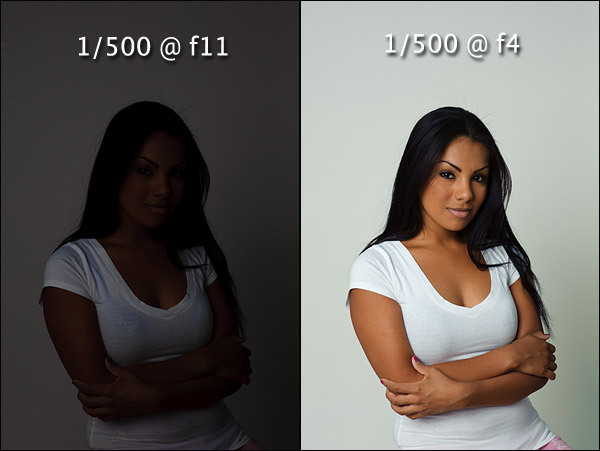 So those aren’t the same exposure settings. Hi there and thanks a lot! Yes, sorry, 5 f-stops, sure. Now I checked my math again and did the corresponding tests. I think I got the rest of it right. What was not that easy and clear for me was, that — when calculating with HSS — of course I have to deal with the exposure time. Like with ambient light. Another aspect, that was not totally clear to me, is that HSS always means (approx) 1/4 flash power, on all settings. I struggled first thinking, that … with a manual setting of 1/8 in non-HSS, HSS could deliver also 1/8 (having still headroom left). This gives *almost* the same exposure. I got exactly the same with f/3.5 or with 1/800 (see below). The 1/125 s is irrelevant, we have to calculate with t_sync = 1/200 s (on Canon cams), because we compared the two flash modi on that max sync speed. // btw. : your two books are great! Thanks for this tutorials. They are the best I found. My question is: Can I keep my camera in Aperture priority on lets say f5.6 and the flash on High speed sync and shoot my children in a park where the lightning differ without warring that when shutter speed goes below high speed sync the output of the flash is dimmed? Ovidu … whether you’re out of range with your flash in high-speed sync, is something you’d have to check on the back of the flash’s display. The way you describe could work … but you’d have to be aware of the distance limitation. Thanks for your useful articles on High speed flash sync and Maximum flash sync speed…I tried copying your “exercise” under max flash sync speed, but could not get my shutter speed faster than the max sync of 1/250s on my Nikon D300s? Putting it on Auto FP 250 did not do anything, since my camera keeps flipping back to the max sync speed of 1/250s? What am I doing wrong? Does the flash needs to be handled manually instead of TTL? Would I be able to use high speed sync using YN560 triggered by RF603 on a D70 body? I understand the “linearity” behavior of HSS, as you explain it, but I don’t see the connection to maximum sync speed. Why can’t I use 1/160 or 1/100 or 1/60 sync speed on a bright day, along with the small, appropriate F stop (like F/22)? Dennis … when I say 1/250th, it is meant to imply maximum flash sync speed, whatever it may be on another particular camera. Now, about why maximum flash sync speed is important. Let’s say you have a scenario where your subject is in shade, against a brighter background. Let’s say it is 1/60th @ f/16 kind of bright. f/16 is a small aperture. It limits what you can do with just one speedlight. f/16 doesn’t allow the use of a softbox with a speedlight. 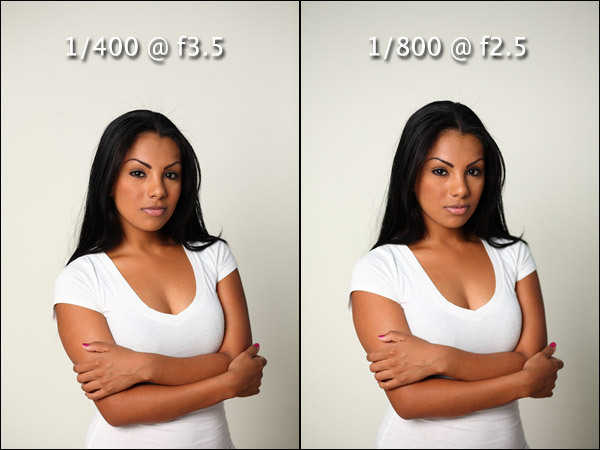 Now, bump your shutter speed to 1/250th, and then your aperture changes to f/8 …. and suddenly you’re more in the range of what a speedlight is capable of. It’s as simple as that. The higher shutter speed gives you a wider aperture, which is more flash-friendly when shooting in bright light. I’ve read some of the articles related to high speed speed and they don’t recommend using it as it will use more battery and thus, kill the flash faster. I’m going to take the photos of a wedding, there is a possibility that the day will be bright and sunny under midday sun. Most likely I have to use fill in flash with on camera flash for the portrait. I usually take photos indoors or under cloudy day. I’m just in a confused stage at the moment. As I don’t want to use up the battery or worse break the flash during that session. Is that true by using the flash on high speed sync that those will happen? I like to keep the ambient light there and try not to over power the sun either for this matter. It’s just to lift up the shadow. Can you please help me on this? No, you won’t kill your flash, it actually loses power as in the distance reachable is immediately almost halved the moment you go just 1/3rd of a stop over the sync speed, that’s all. Keep your normal settings for full sunlight and depending on your camera, use the base ISO [100 Canon; normally 200 Nikon] and go to max shutter sync speed, usually 200th Canon, 250th Nikon and around the f11-f14 mark. Now put your flash on, and dial the FEC on flash down to the -2 or -3 mark it will only lift the shadows. Obviously it’s shoot and see. Go get a white towel or somesuch, go outside in middle of day, and test your camera’s settings, with flash and see what you get. I am in the tropics in Australia and 90% of my weddings are location, beach, park, generally under full sun, so I compensate various ways, sometimes I may go High Speed Sync, if I want a shallow depth field, but if you keep your eye on the back of the flash, it will actually tell you what distance/s are achievable with the camera settings anyway. Oh, shoot camera in manual mode, perfect consistency. The only caveat would be the overcast or sun sifting in/out of clouds, that will play havoc with your metering. Hi Neil, thanks so much for this article! Great work, and great enlightenment to find out the whole thing is merely a physical limitation of how the shutter works, and not something that can be engineered away. Also, I of course had fallen for the HSS-bright-sunlight thing as well! Thanks so much again! I’ve been struggling with trying to get dark, blue skies in my portraits, and I always thought that using a higher shutter speed would darken them and that I needed HSS. In the 4th point at the end of the article you said it isn’t true. What do you suggest then? What’s the best equipment/technique for the job? Do I need a neural density filter and a stronger flash? Simply expose for your background, manual mode, then light them up with flash. This is if of course there is something to work with in the first place regarding skies, and under normal sunny settings would be ISO 100, 250th or 200th depending on flash sync and f11-f13. You should then retain whatever the light is in the skies, being from light to dark blue, depending on how much sky you include in the photo. 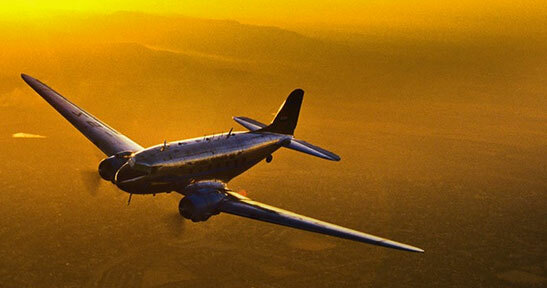 Remember, under normal conditions it’s always much lighter at the horizon and gets darker as you look up. Normally the darkest part of the sky is a fully 180 degrees from the side, in other words, the direct opposite side of the sky from the sun is the sky’s darkest part, but you then are looking at maybe trouble with direct sunlight in faces, eyes and squinting with harsh shadows under eyes, etc. So, choose something slightly side-lit from sun and fill flash for normal sunny shooting, like this article. Bryan .. you can change the shutter speed and go into HSS mode. However, it is a problem when you’re already at the outer limit of what the flash is capable of. If you now lose 1 – 2 stops of light because you’re in HSS mode, you took a step backwards in trying to over-power the bright daylight. So what could you do? Change your aperture to get the available light to where you want. If the DoF is too much, then a ND filter. Or … go into HSS mode, but move your light closer, or add a second light. 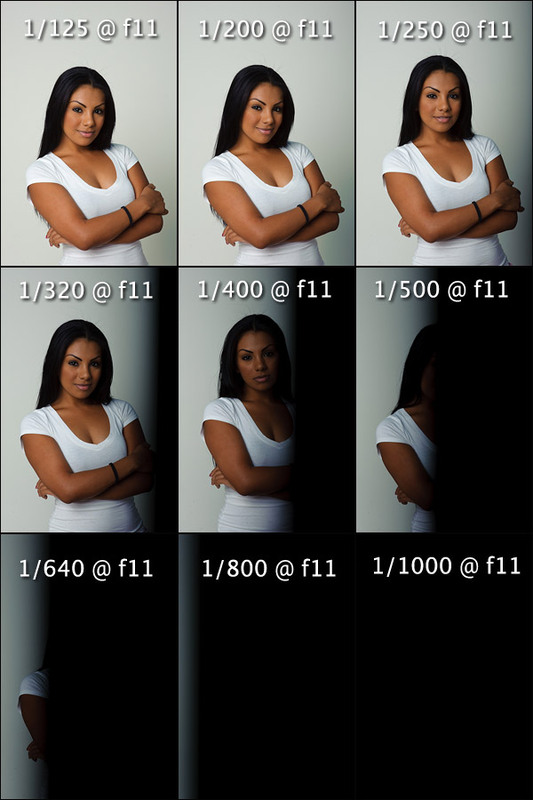 As I said, these considerations really come into play if you’re pushing the limit on what your flash can deliver. Also, check out this article: getting the most out of your speedlight and see if it all comes together for you. I have one major doubt in understanding high flash sync. I use fuji x100s . It has leaf shutter which help me go 1/1000th of sec at F/2 . I want to achieve this high flash sync..?? Does Flash also need to support this high sync speed ? or its just limiting in camera body ? The duration of SB-28 (I think it’s T.1 time, meaning the time it takes for the flash output to come down to 10% of peak) is 1/265 sec. at full (1/1) power, and 1/954 sec. at (1/2) power. So you can set your SB-28 to 1/2 power manually, and count on using most of the output at 1/1000 sec. You may get a higher exposure with 1/1 power, but you cannot use all of it because the flash duration is longer than your shutter. The Fuji X100s syncs to around 1/500 without (much) loss in power. Higher than that, you can sync at the faster shutter speed, but there is around 1.5 to 2 stops of light loss from your flash for every stop you increase the shutter speed. Neil, Thanks for this ever-so-helpful article, and thanks for being such a clear and concise writer. I confess, I started out by trying to read someone else’s article on HSS first, and after pulling my hair out, I stopped about midway through that article and switched to yours. Between the diagrams and the excellent writing, yours totally did the job. THANK YOU SO MUCH. One question: Having started working with flash way back in the Sunpak Potato Masher Day, long before TTL, I’m very used to reading the distance scale when I want to use manual/power ratio for fill. Do you know if I’m going to be able to rely on the distance scale for HSS? (Or Auto FP as they apparently call it in Nikon?) Will the camera (D300/D800) and flash (SB900) be smart enough to see that I’m in HSS, with a shutter speed of 1/2000 for example, and calculate what distance my flash will be able to provide full power? Yes! The flash will tell you the distance on LCD display. If the distance doesn’t appear, it means your flash is in a bounce position. Just click it into the direct-forward position, and the distance scale will appear. 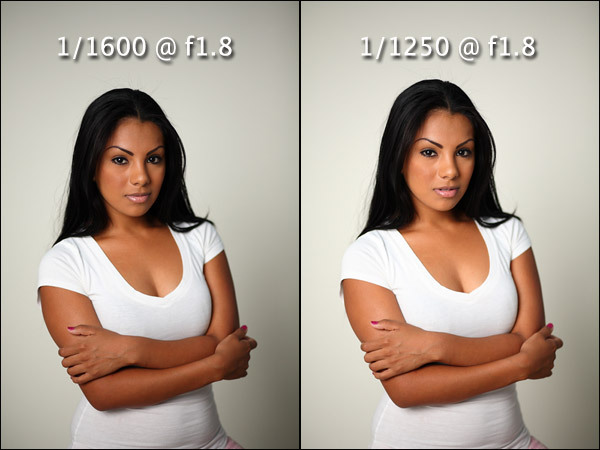 Unless of course, you cheaper out on the flash and have a flash without the distance scale. Then you’ll have to use the Guide Number of your flash. 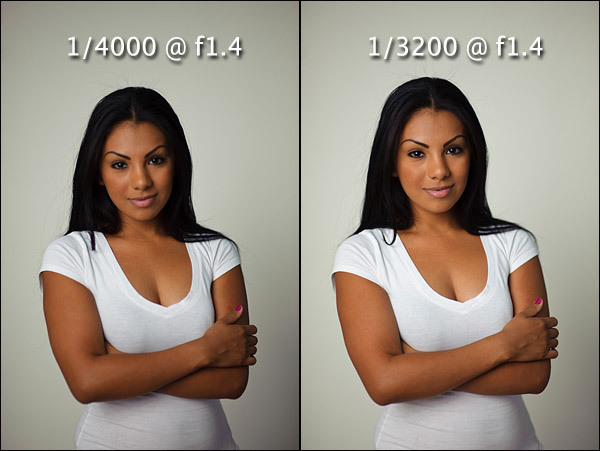 And if course, the moment you add a modifier (like a softbox or umbrella), then the distance scale is meaningless. Hi I am curious if you tried using more than one speedlight in HSS mode for a little more depth of field? Think maybe two or three. I am comparing the pros and cons of the HSS in Nikon speedlights compared to Pocket Wizards Hypersync method. Have you any experience with that system? George … that doesn’t really make sense, because you would be using high-speed flash sync to chase that wider apertures (or higher shutter speeds.) So if you needed more DoF, you could just use a smaller aperture. Done! I haven’t explored HyperSync mode. I’ve spent quite a bit of time researching HSS the past week or so, and have yet to come upon an answer to my question. I know this post is old, but you seem like you may be the man to ask! Most posts are concerned primarily with overpowering the ambient, and the ability to use a shallow DOF. However, I’m interested in HSS to freeze a fast-moving subject without the ambient going overly dark. A particular example would be shooting motocross during the day or early evening. I’ve had no luck freezing motion at sync speed, at least not without the ambient going too dark. Am I doing it wrong — should I be able to freeze motion with the flash at 1/200th and get a well-exposed background? Or is HSS the answer I’ve been seeking? Your instincts are correct – you would need the shutter speed to be high to help freeze the action. The short duration flash isn’t going to do it on its own. For what you want to achieve, you’d have to use bare speedlights. Any kind of diffusion will just cut the power down too much. Thanks for your speedy reply! 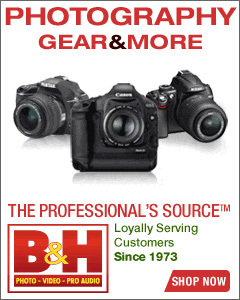 I’m renting a couple of Profoto B1s next week – first time I’ll get to experiment with HSS. Because of this post, I’ll understand what’s happening when the shutter starts affecting the flash’s exposure! Oh, you’re going to love the Profoto B1. Check out this recent post, though I did use it here simply for shallow DoF. I love your posts, very informative and backed up by experiments and theory. I have one question regarding your statement about the “biggest fallacy” in flash photography and overpowering the ambient light with flashes. Going into HSS drops light output of the flash by 2-3 stops immediately. However, I don’t see the output further degrading as the exposure time shortens. So, it seems that by going from 1/250 to 1/500 we’d lose in our fight with the ambient light. But what if we go to 1/2000, 1/4000 or 1/8000. 1/8000 is 5 stops less ambient light than at 1/250, but the HSS is only 2-3 stops below its max output in non-HSS. So it seems to me that we’d gain at least 2 stops in our fight with the ambient light. Please point out fallacy in this reasoning. In case Neil doesn’t see your question: My understanding is that a flash acts as/like a constant light source when in HSS mode. 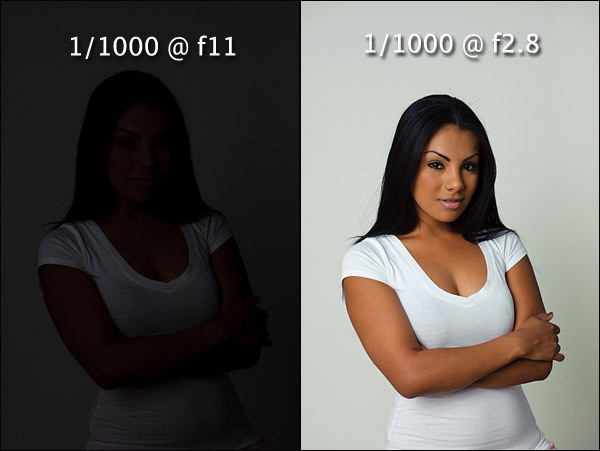 So the effect from the flash will become directly proportional to your shutter speed, just like ambient light does. Sorry, but I don’t know of a better way to explain it. I hope that makes sense. You are correct in that it appears like the flash output doesn’t diminish proportionally once we work in high-speed territory. And it is exactly as Jason explained. and that our correct ambient exposure (for the background) is 1/250 @ f/5.6 and our subject is shaded and we need to use flash to balance our exposure between our subject and the brighter background. If we have our flash power set to (for example) 1/8th of maximum to get f/5.6 for that distance and 1/250th …. if we go to 1/500, then we would need a two stop increase in our flash to compensate for the reduced flash … HOWEVER, we are now shooting at f/4 for that same ambient exposure. So we really only need one stop more light from our flash. The other stop of light is taken care of with the wider aperture. I hope this answers your question, and makes things a little more clear. If not, let me know, and we look at this again from another perspective until it makes sense. The “fallacy” comes in, in that people think High Speed Flash sync reduces ambient light with the higher shutter speed … but in reality, we lose one stop of light immediately. If you have enough flash juice to work in HSS in bright light, then that’s great. However, if you are battling strong ambient light with your flash, and you are on the edge of what is possible with your flash, then you don’t want to go to HSS immediately. You lose flash power.